We are pleased to offer Joe Buchers DepthRaiders the most talked about big fish crankbait of all time. We have the 8" floating model in straight and jointed the 8" Count Down model in straight and the 6" straight and jointed Baby DepthRaiders. 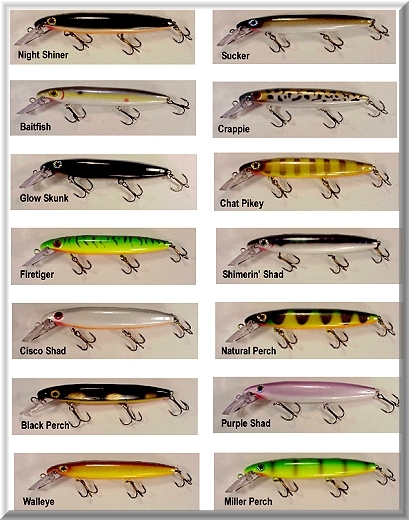 These lures have been specifically designed for fishing weeds and sunken timber. The built-in, tail-up buoyancy of the lures, combined with their large, triangular diving lip, allows them to back out of most hang-ups with comparative ease. 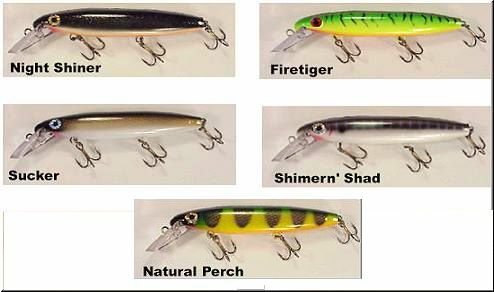 We have carried Depth Raider lures for many years, as we feel they are one of the best Muskie baits around. They are now available in these five vibrant new colors, providing even more fish-catching potential for your arsenal. The Baitfish Is Out Of Stock!!! The down-sized version of the popular DepthRaider, this lure is just right for those muskies looking for a medium-sized snack. It is made of high-tech plastic, and with a triangular lip molded right into the body of the lure, this is one tough little dude! It is 6" in length, weighs 1 ounces, has three 1/0 treble hooks, and rattles. There are seven attractive patterns from which to choose. And Black Perch Are Out Of Stock!!! This smaller-sized, version of the jointed 8"model, is perfect for those early season trips. Just like its larger brother, it sports a triangular lip molded right into the body of the lure. It is 6" long, weighs 1 ounces, has three 1/0 treble hooks, and rattles. It is stocked in seven bright colors. 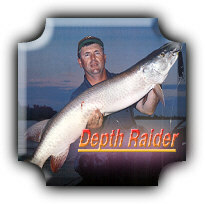 We have carried Depth Raider lures for many years, as we feel they are one of the best Muskie baits around. 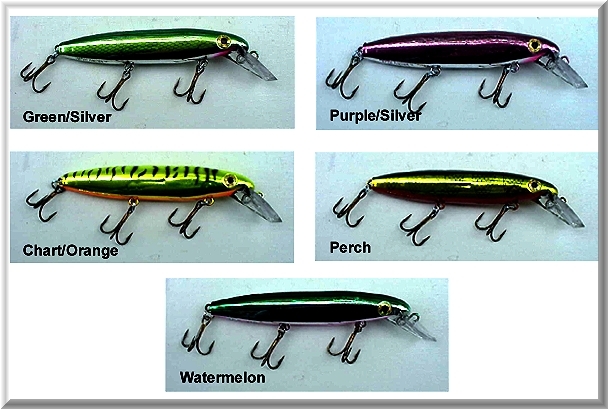 They are now available in these 14 vibrant colors, providing even more fish-catching potential for your arsenal. This lure is made of high-impact Butyrate plastic, with an unbreakable molded lip, heavy-duty hook hangers and split rings, and the most durable paint job in the business. It is 8" long, weighs 2 ounces, has three 3/0 treble hooks, rattles, and will cast and retrieve to depths of 11 to 13, and will troll from 19 to 21. It is available in eight great fish-catching colors. Glow Skunk Is Out Of Stock!!! Miller Perch Is Out Of Stock!!! Tougher than nails this jointed lure is made from high-tech plastic and will track straight and true. Unbreakable molded lip, heavy-duty hook hangers and split rings, and the most durable paint job in the business. It is 8" long, weighs 2 ounces, has three 3/0 treble hooks, rattles, and will cast and retrieve to depths of 10 to 12, and will troll from 18 to 20. It is offered in nine great patterns. Precision designed for deep water fishing, this lure sinks at approximately one foot per second. You can fish at any depth by simply counting as the lure sinks and it has a horizontal sink no tumbles, twists or tangles. It is 8" long, weighs 3 ounces, has three 3/0 treble hooks, and rattles. It comes in six vibrant colors. 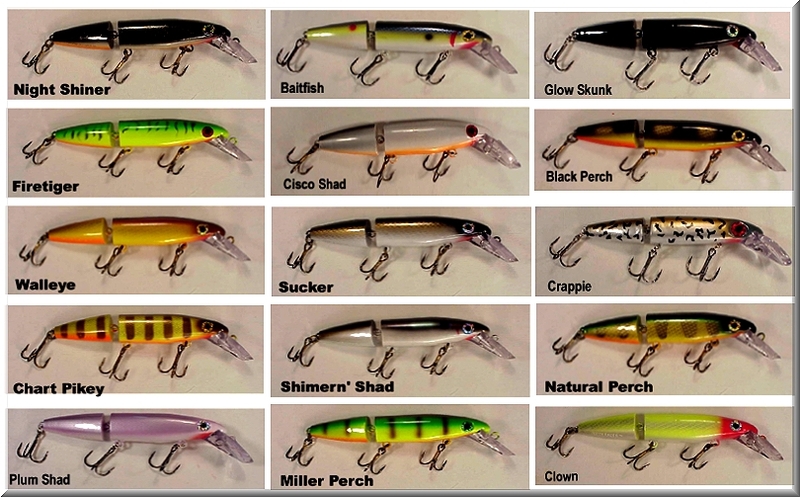 These are the latest Joe Bucher creations…Chrome 8” Straight Depth Raiders. They offer the same sturdy, superb fish-catching abilities that all Bucher Depth Raiders have shown over the years…but with a chrome finish to provide the flash that will attract even more fish. They weight 2.4 ounces and come in five stunning colors. 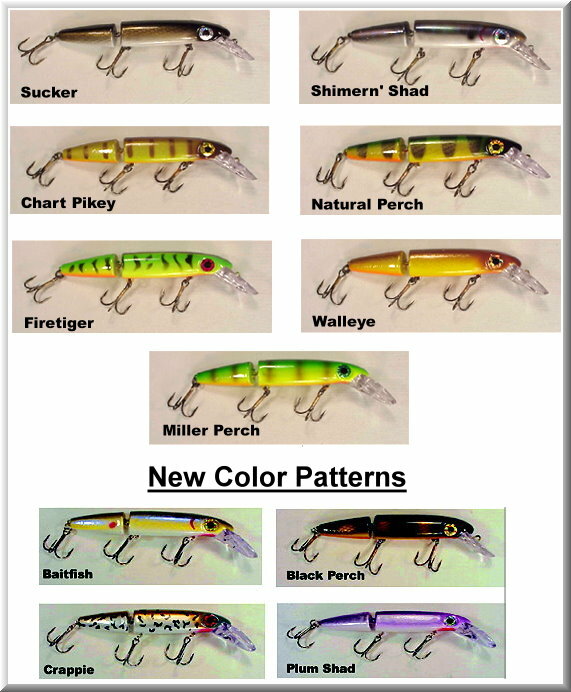 The Chart/Orange And Perch Are Out Of Stock!!! Our low price is only $15.00.